From the wide grasslands of the Masai Mara to the majestic wildlife that roams within it and with No doubt Kenya’s biggest attraction is the natural and majestic movement of huge herds of wildebeests, zebras and gazelle in search for sweet grasses in an annual Trek twice a year famously called the Great Migration. witness the life and death struggles in the Mara River crossings or dramatic encounters with Africa’s top predators taking advantage of the huge herds to grab their meal. Kenya is the land of variety, everywhere you go is extraordinarily different including tribes elegant in their fine outfits. venture deep into the Masai Mara, a reserve that contains the country’s highest concentration of big game, including iconic creatures such as lion, wildebeest and elephants. The untouched culture here is a real highlight however areas such as the Masai Mara, combined with the North are different and it feels like you’ve been in two different countries. The Great Rift Valley also passes through Kenya and the lakes can provide a relaxing change to your safari. Our Safari experts at Gorilla walking Safaris have put together some packages to guide you making fundamental decisions for a perfect inspirational journey but we are able to take an extra mile and put together for you an itinerary designed and fashioned just for you. Enjoy A vibrant wildlife encounter safari on a 12 days Of typical African safari. Be Rewarded and be Inspired with Family In Kenya. Be witness to the worlds magical spectacle in Masai Mara. 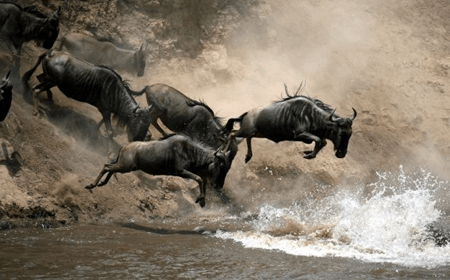 Watch as Thousands and Millions of wildebeest cross the crocodile fested River. Discover The best highlights os kenya in an 8 days circuit. be inspired with e spectacular wildlife including the famous masai mara. 3 days Fly In Masai Mara Expedition. Visit the iconic masai mara in a 3 days expedition by air. Arrive to a spectacular wildlife encounter and slumber in very iconic safari lodges. Discover the Shadow of Kilimanjaro and the famous Masai mara in a five days Classic safari. Watch home to hundreds of elephants grazing and millions of Wilderbeasts. Be rewarded to a 10 days through kenya’s iconic destinations. Spectate to the worlds Specatcles in masai mara, the elephant populated Ambesoli and the Still virgin Samburu N.Parks.